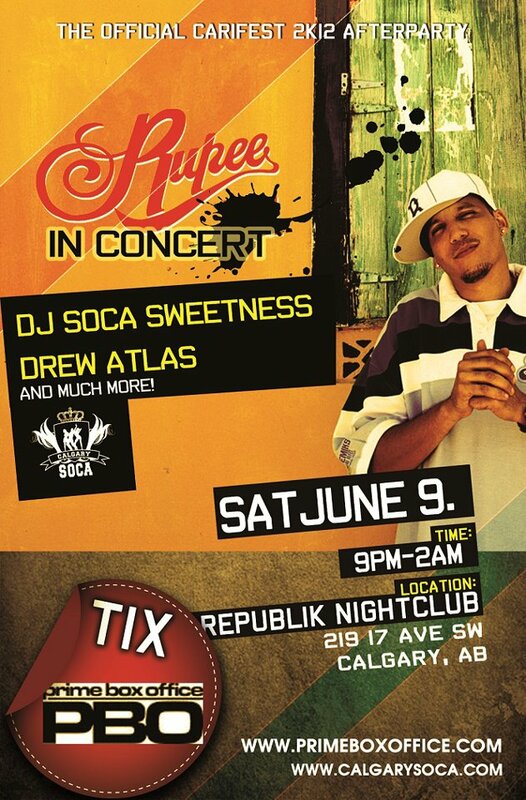 Bajan Soca sensation, Rupee came to Calgary on June 9th as a part of Calgary's 31st Carifest Celebrations. Rupee, best known for chart-topping hits including "Ice Cream", "Jump", "What Happens In De Party", and the internationally released, "Tempted to Touch", brought his brand of Soca to both Shaw Millennium Park during the day, and as the headliner for the official afterparty later that evening at the Republik Nightclub (219 17ave SW, Calgary.). Joining the festivities were, the man voted Canada's #1 Soca DJ for 2010 and 2011, DJ Soca Sweetness, Florida's Barrie Hype who rocked on stage with and helped Rupee deliver the heat, and CalgarySoca's own Drew Atlas. Below are a couple highlights of Rupee's time in Calgary thanks to some very appreciative fans.